Because Albina Yard’s glulam components and CLTs were prefabricated off-site in a controlled environment and because of their inherent dimensional stability, LEVER designed the building to an unusually tight tolerance of 1/8 inch. But the team wisely decided to construct the ground-floor structure before fabricating the rest of the frame in order to work out any glitches that might arise in the system. They found that they hadn’t accounted for the full depth of the fillet welds on column-to-beam connectors. “A little grinding to fit the beams was the only on-site correction we had to do,” says Robinson. The CNC software that cut the slots in the glulam elements for the connectors was adjusted to account for the welds, and the rest of the structure went up without a hitch. Not only was the building erected easily, but it also went up quickly. Each of the 4,000-­square-foot CLT floor decks was installed in about four hours. With conventional methods, each level would have required up to a week, Robinson estimates. The construction method offered other benefits, including a quiet construction site and “just-in-time” material delivery, with the components arriving at the site immediately before they were ready to be installed. Such an approach is especially appropriate for projects in dense urban areas, where on-site storage and staging space is at a premium. Although LEVER is currently working on a project that will rely on CLT for its structural core in addition to its superstructure (Record, June 2017, see sidebar, page 124), Albina Yard has a more conventional wood-frame core sheathed in plywood with hold-downs at each level. The core, along with the specially fabricated column-to-beam connectors, helps the building comply with seismic requirements. Fabricated in a local shop, the steel components are screwed to the columns but support the beams only with friction connections. They are embedded in the beam-ends with a saddle for the primary structure and a pin connection for the joist beams. The result is a seamless grid of glulam beams supported by hefty, square glulam columns—without a fastener in sight. 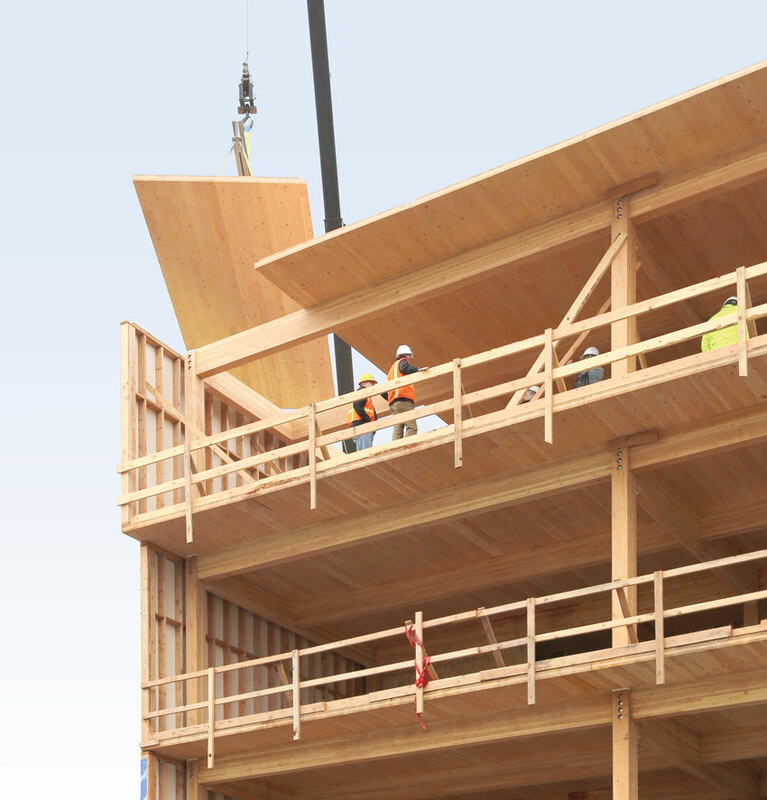 Mass timber is substantially lighter than concrete or steel-frame construction. In addition to smaller gravity loads, a lighter structure can reduce lateral loads, which in turn further decreases the demands on the foundation, according to Eric McDonnell, a structural engineer for the project with KPFF in Portland. He adds that, while smaller loads can allow smaller foundations, in some cases they can also preclude the need for expensive piles or even allow for a taller structure. For Albina Yard, the foundation loads are between 40 percent to 60 percent less than if the superstructure had been steel or concrete, estimates McDonnell. Mass timber has several ecological advantages over typical construction methods. The earth’s forests make up an enormous carbon sink that absorbs about 30 percent of global carbon dioxide emissions. When dry, one half of wood’s weight is made up of carbon, which it retains until it is burned or decomposes. According to European studies, one cubic meter of structural lumber can store about one metric ton of CO2. Also, mass timber is comprised of large-scale components that can be more easily disassembled and reused than those of many concrete and steel structures. Even standard stick framing, because of multiple fasteners and adhesives, is difficult to deconstruct intact. Because the floors are made up of CLT panels fabricated off-site, each of the 4,000-square-foot decks was installed in about four hours. The prefabrication offered other benefits, including a quiet construction site and just-in-time delivery. When compared to a concrete structure, mass timber scores better across the board in terms of its impact on the environment. A 2012 study by the University of British Columbia’s Sustainable Building Science Program found that producing mass-timber structures generates less air pollution, less toxic waste, requires less water, and embodies 18 percent less energy from nonrenewable sources than a concrete building. Overall, concrete has two-and-a-half times the potential impact for global warming than mass timber, the study asserts.